Do you have customer service in Spanish? 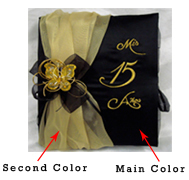 Can I order a full package for a quinceanera doll in a color that you don't show on your website? Do you have different embroidery options for your dolls? What happens if I receive my merchandise damaged? What is main color and second color? 1.- Do I need a Paypal account? No, you don't need a Paypal Account. You can use any mayor credit card as well. 2.- Can you send C.O.D.? Yes, but UPS will charge an extra fee. 3.- Do you have specials? Our prices are already significantly lower than what our competitors offer. But, we do occasionally add items to our "Specials" page. Also, we will sell wholesale at a special rate for businesses, so please contact us for more information. 4.- Do you have customer service in Spanish? Yes, we can help you in Spanish. 5.- Can I order a full package for a quinceanera doll in a color that you don't show on your website? Yes. We can make almost any color combination. But, if we are unable to for any reason, we will try to match the color as best as possible. 6.- Do you have different embroidery options for your dolls? Yes. If you would like to see more options, please contact us. 7.- What happens if I receive my merchandise damaged? If you receive your order in an unacceptable condition, save the original box and call us or e-mail us as soon as possible. 8.- Can I buy wholesale? Yes. We offer great discounts for businesses. Call or e-mail us for more details. 9.- Can I visit your store? Unfortunately, no. We sell online only. 10.- What is main color and second color? As we show in this picture, black is the main color that will show more and gold is the second color that we use for decoration.